Our detox soap bar contains lovely skin loving oils such as coconut oil, organic jojoba oil, almond oil, olive oil & organic shea butter with added activated charcoal and rose clay. 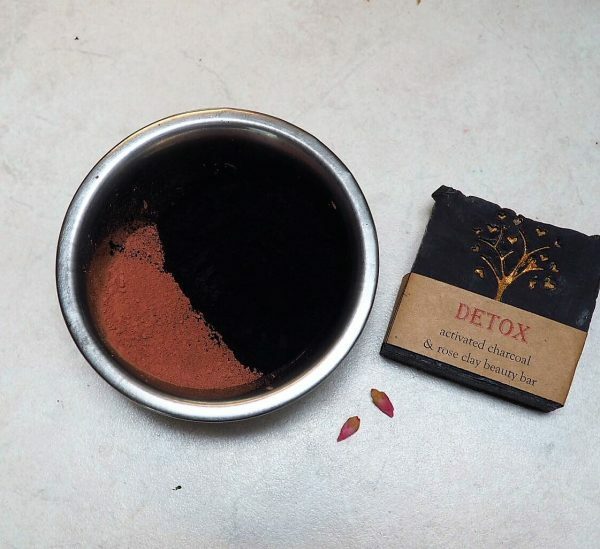 Activated charcoal is used for the detoxification of impurities from your skin. Rose clay is a natural agent to help beautify the skin. It has the ability to absorb excess oils, dirt & impurities from the skin. Lemon Myrtle, lemongrass and sweet orange essential oils all have antibacterial properties making this soap particularly great for acne prone skin types. Ingredients: Olive oil, distilled water, macadamia oil, coconut oil, organic shea butter, castor oil, organic avocado oil, organic jojoba oil, activated bamboo charcoal, spirulina, rose clay, lemongrass, lemon myrtle & sweet orange essential oils. Lovely to use, smells wonderful.